If you love sports and have excellent verbal communication skills then you can choose a career as sports commentator. A job as a Sports Commentator falls under the broader career category of Radio and Television Announcers. A sports commentator is an expert reporting a live match on radio or television in real time. Commentary is about enhancing the viewer's pleasure by describing the scene of action pleasantly. In the radio and television field, commentating is considered as a popular form of journalism. There are two kinds of sports commentators. One is the play-by-play commentator, which is actually an announcer. What he does is basically report what is going on in the game. The other kind of sports commentator is the color commentator. A color commentator is different from a play-by-play commentator in that the former needs to be able to provide more than a report. A color commentator is expected to be able to give additional insight and analyze the goings on in the game. While Play-by-play announcers provide ongoing commentary about the game, Color commentators assist the play-by-play announcers by filling up dead air with stats or other background information, thus making the commentary more interesting. Sports commentators describe on-the-field action and provide analysis throughout a live sporting event, over a television or radio broadcast. Sports commentators must concisely and passionately convey the excitement of a sporting event to their viewers or listeners in an unbiased way. They must convince an audience of the event's authenticity and be as descriptive as if the audience were witnessing the game in person. They must be able to concentrate on what is happening in the game and then while they are relaying this to the audience, they must be sure of what they are talking about. In simple terms, Sports Commentator provides a running commentary of a sporting event as the action occurs, either on TV or radio. Depending on the medium ie. TV or radio, commentators will use different techniques to describe the action. TV broadcasts require less description of the action because the pictures tell much of the story. On radio, the listener is completely dependent on the commentator. Sports commentators may cover a live game from the stadium, or they may give commentary from inside the studio. Sports commentators must know the teams that are playing as well as have knowledge about specific players. When the game becomes dull in between, the sports commentator may also have talk about things apart from the game like current sports events or profile of a player so as to impress and engage the audience or listeners. The work can be both physically and emotionally stressful. As the commentating is live on TV or radio, one should be careful while giving commentary and it must be free from errors. Another difficulty is the timing as sometimes they even have to work late in the evenings or night depending on when the games take place. There are no specific courses to become a sports commentator. A Bachelor degree in Mass communication and journalism is considered as an entry requirement. Also speech or voice training is beneficial to develop an appealing voice. Sports commentators have opportunities in all major radio stations or TV stations. Apart from that, commentators have career avenues in specialized sports sites which relay play by play commentaries. Even with much scope the field of Sports commentators is extremely competitive, therefore experience in the area is a prime factor. Radio stations can be considered as the entry point to a career as a commentator. Later they can move on to TV or other private channels/medias. At the initial stage, your role may be to give commentaries on a local sporting event for some small station. Once you prove your track record, you can get placed with big organizations easily. One may need a rich, long experience in the sports arena to get hired by a sports channel. Along with the above requirement, personality and appearance play an important role in getting hired as a sports commentator because these professionals are in the public spotlight. College life is a great time to get some experience. Many colleges run student radio, and this is a good opportunity to get some live broadcast experience. The primary task of a sports commentator is to relay the activities that are happening on the field to their audience, to give them an idea about what exactly is happening during play. They are employed by newspapers, radios or by TV stations to comment on the match. Sports channel such as Star Sports, ESPN Ten Sports, Zee Sports and DD Sports employ sports commentators. Sports commentators are also employed by sports organizations and networks to cover live action i.e play-by-play of sporting events. Some sports commentators perform other roles in the broadcast media industry. They write a column, or work as a broadcast reporter. They may go to the play ground, talk to players, get their feedback live, in between the game. Commentators write commentaries or columns for newspapers, magazines, or other publications. 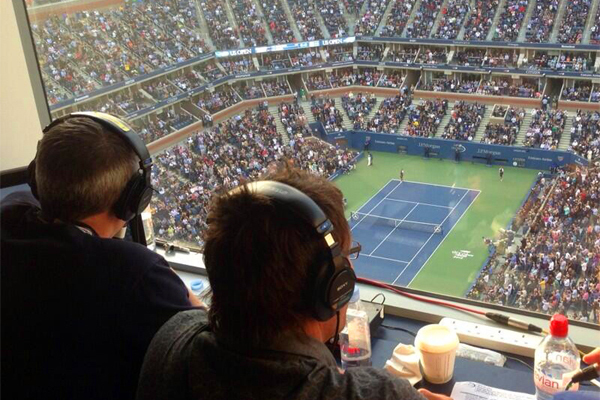 In majority cases, former sportsmen after retirement take up commentating as a profession. Good commentators usually build up fan bases of their own. Although this can be a very rewarding career, entry is competitive, and pay at many times can often be low. The pay scale for commentators varies greatly, mainly depending on the place of employment and the commentator's own quality (how good and famous he is) and presentation. TV commentators usually earn more than radio commentators do. In India, the average salary earned by a sports commentator is Rs. 5,000 to Rs. 10,000 per day that the commentator is working. A more established sports commentator can earn up to Rs. 25,000 per day. Your annual income depends on the number of days in a year you get work.